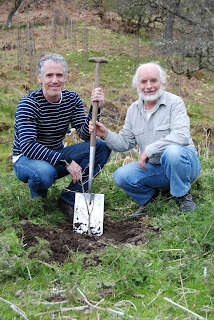 A symbolically important moment in the restoration of one of the “world’s greatest woodland habitats” was celebrated on Sunday 20 May 2012 when acclaimed wildlife cameraman and filmmaker Gordon Buchanan planted Trees for Life’s Millionth Tree in Scotland’s Caledonian Forest. The event took place at a celebration event held at the award-winning conservation charity’s Dundreggan Estate near Loch Ness, in Glen Moriston, Inverness-shire. "Magnificent and magical, the Caledonian Forest is a wild place at its most wonderful. Every single tree planted helps to restore one of the world's greatest woodland habitats. One tree will be used by a thousand species in a forest that will stand for 10,000 years, which in that time can be enjoyed by a million people. Great forests are established one tree at a time. I am honoured to plant the millionth tree on behalf of Trees for Life," said Gordon Buchanan. “It’s fitting that Scotland should be in the forefront of restoring its world-class wild landscapes, having been one of the first countries to lose its forests and much of its wildlife. We are proud to be playing a key role in bringing our equivalent of a rainforest back from the brink of being lost forever. The event also saw the planting of the first of Trees for Life’s next million trees, including one by the charity’s patron and Highlands naturalist, author and presenter Roy Dennis. There were performances by the Woodland Orchestra, activities by environmental education charity Wild Things!, guided walks, and a celebratory barbecue. Support also came from other well-known public figures, including writers and broadcasters Muriel Gray and Vanessa Collingridge, both of whom are Trees for Life patrons. Vanessa said: "The celebrations for the Millionth Tree are not only for the inspirational work of Trees for Life and everyone who's played a part in this magnificent effort. For me, the real celebrations will be among the communities of insects, animals and plant life that are all thriving in the webs of life created by the emerging forests. I'm so proud to have played my own small part in planting not only a landscape of trees but a landscape of life and joy. Congratulations to all of you who've been involved – and to all the plants and creatures that now thrive in their new home." People can help Trees for Life to plant its next million trees by purchasing dedicated trees and groves. The charity’s award-winning volunteer Conservation Holiday weeks offer opportunities to gain practical conservation experience. Trees for Life aims to restore the Caledonian Forest to an area of over 2,500 square kilometres in the Highlands west of Inverness and Loch Ness. For more information, see www.treesforlife.org.uk or call 0845 458 3505.